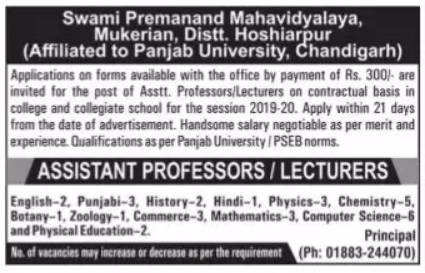 Swami Premanand Mahavidyalaya, Hoshiarpur has advertised in the TRIBUNE newspaper for recruitment of Assistant Professor / Lecturers jobs vacancies. Interested and eligible job aspirants are requested to apply within 21 days from 10th April 2019. Check out further more details below. About College: The college derives its name form SWAMI PREMANAND – a saint and philosopher of the modern times. He has been a great force in pioneering the religious sentiments in the second and third quarter of the past century. The essential spirit of Swamiji’s message lays emphasis upon the need for abolishing ignorance and dogmatic beliefs, which had for centuries crippled the human mind. So it was thought appropriate by the people of the area to raise an educational institution in the memory of this enlightened son of God who met with a fatal accident on 23rd April, 1965 at Mukerian. How to Apply: Interested and eligible candidates are requested to send their resume along with copies of relevant documents and photographs to the following Postal Address within 21 days. District – Hoshiarpur (Punjab), India.